Taste test: These are very good barbecue chips, with a mix of sweetness and some mild heat. They're thin and have a good amount of flavoring on each chip. 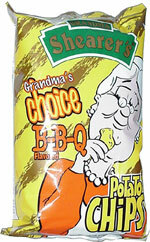 Best of all, Grandma Shear packed a ton of chips into this large bag. Smell test: Mild barbecue smell. Nice.